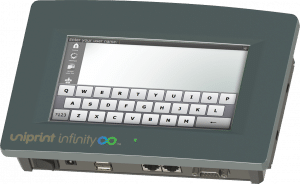 UniPrint Infinity™ vPad Pro is a multipurpose network print appliance. The device enables dual print security through PDF encryption and user-authenticated pull printing, while the UniPrint Infinity printing software is deployed. It can also replace print servers in remote locations and, by allowing print stream compression, solves remote printing bandwidth issues that frequently occur with print server centralization initiatives. By utilizing print stream compression, remote print servers can be consolidated to the data centre. 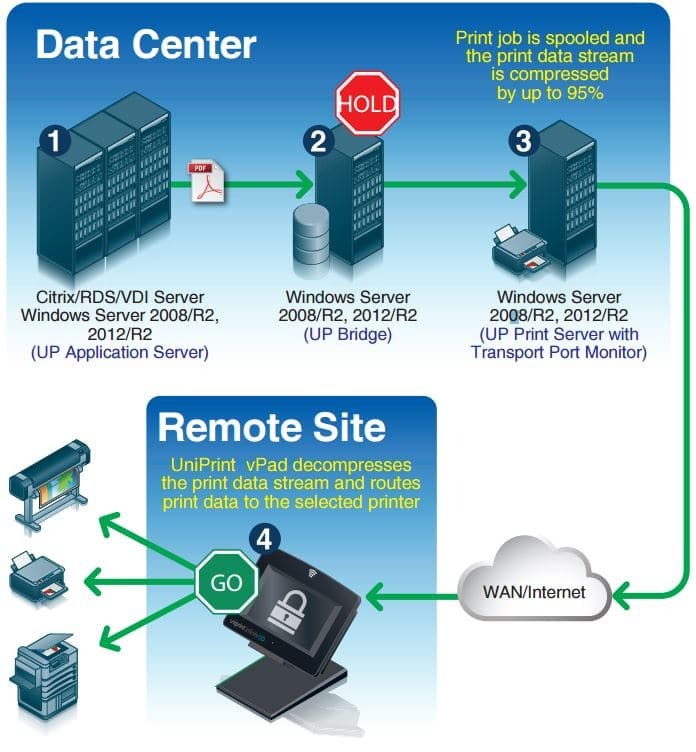 The data centre print server compresses the print data before transmission and the remote office vPad decompresses the print stream before sending it to a user-selected printer. This device is compatible with all printer makes and models and therefore does not require printer fleet standardization. Simply use the printers you already have. It also does not store any user or print job data, making this a truly secure printing solution. Allow users to “Tap and Print” securely, on demand. Solve remote printing and bandwidth issues with print server centralization. A user prints from any application to one virtual print queue (VPQ). UniPrint Universal Printer Driver (UPD) converts and encrypts the print data into a PDF print job and stores it in a holding server (UP Bridge). The print job is sent to the central printer server where it is spooled. Spooled print data on a central print server print queue can be many times the size of the original document. Using the UniPrint Transport Port Monitor, a spooled print job can be compressed by up to 95%. The remote user authenticates on the vPad, and selects the document for printing. The compressed print data is decompressed for release on the selected printer in the proximity for immediate pickup. Tip: No print data is stored on the vPad or in the printer hard drive. Secure pull printing through vPad eliminates possible security breaches of sensitive print data, such as patient health records and personal financial profiles, should theft or decommissioning of the vPad or printer hardware occur. Tip: The simplistic design of Print Stream Compression only requires network ports to be open on the data center server side, allowing print data to be sent to a remote site with zero configurations. One vPad can handle up to 5 simultaneous print jobs, and can be set up with an unlimited number of printers as end points.